One half of all mental disorders manifest by age fourteen (DiNitto & McNeece, 2008, p. 153). This fact alone would suggest that addressing the mental health needs of children and adolescents should be the primary concern of mental health professionals. Unfortunately, mental health services for children are lagging far behind those for adults. Social workers assist children of all ages, but they often try to identify those with mental illness or developmental problems as early as possible. Factors, other than biology, that increase a child’s risk for developing mental disorders include: physical, sexual, or substance abuse, running away from home, abusing others, family violence, having a caregiver or sibling who has been institutionalized or who has a felony conviction of substance abuse problem (DiNitto & McNeece, 2008, p. 153). Many individuals with mental health problems have co-occurring disorders, such as substance abuse and medical problems. Having co-occurring disorders makes getting the proper treatment even more difficult. According to DiNitto and McNeece, “[i]deally, treatment agencies provide integrated treatments that address SMI, substance abuse, and medical problems simultaneously, but in many states, integrated programs are in their infancy, and consumers must go from agency to agency in what is a fragmented service delivery system” (2008, p. 154). Social workers usually work as part of a professional team, which includes physicians and nurses, and often conduct home visits to better understand the clients’ biopsychosocial conditions. Treatment techniques for these individuals can include: medication, education and outreach, peer support, and behavior therapy (DiNitto & McNeece, 2008, p. 154). 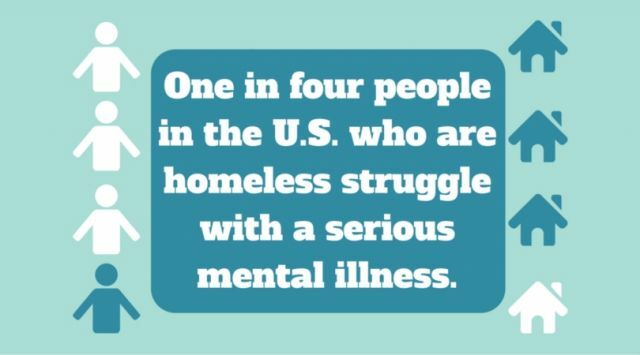 Roughly 25 percent of those who are homeless have a serious mental illness, and about one half of these individuals also have co-occurring disorders (DiNitto & McNeece, 2008, p. 154). Homeless families are a rapidly growing population, and “[s]eventy-six percent of homeless children have a mother who has major depression, schizophrenia, a substance use disorder, or high distress (Hicks-Coolick, Burnside-Eaton, & Peters, 2003)” (DiNitto & McNeece, 2008, p. 155). These children also tend to show signs of mental health problems. Social workers may provide mental health services in homeless shelters, or they may be part of an assertive community treatment (ACT) team that delivers services to the homeless out on the streets. Military personnel, especially those in combat, can experience mental health problems, such as post-traumatic stress disorder, and often have co-occurring disorders, such as substance abuse. Also, “[m]ilitary personnel and their families can face a pileup of stressors that puts them at risk of dysfunction, including moving often; adapting to living in other countries; episodic or long separations; and, during wartime, the fear of death or disability (Black, 1993)” (DiNitto & McNeece, 2008, p. 155). Social workers, many of whom are employed by the VA, help by addressing child abuse and IPV, and by providing mental health services and substance abuse treatment. Social workers can be, but are not required to be, military personnel themselves.